The October round of Shiny Shabby is open and Miamai has a wonderful new jewelry gacha, the Levels Parure! What is a parure you ask? It is the French verb for adorn however when speaking of jewelry it is a wardrobe of jewelry that has 3 or more pieces. A parure was a sign of status and wealth, no woman would have dared to not have at least the minimum of set. Embracing the cultural significance of these jewelry collections Miamai has placed all the items in the Levels Parure gacha enabling you to wear a modern parure in the traditional fashion of mixing them up and creating your own look. The Levels Parure has 5 parures to collect, each one having 2 bracelets, earrings, and a necklace giving you the opportunity to win 20 prices total. The Levels Parure is a stunning collection made in precious metals and enameled pieces with beautiful black leather for the bracelets. 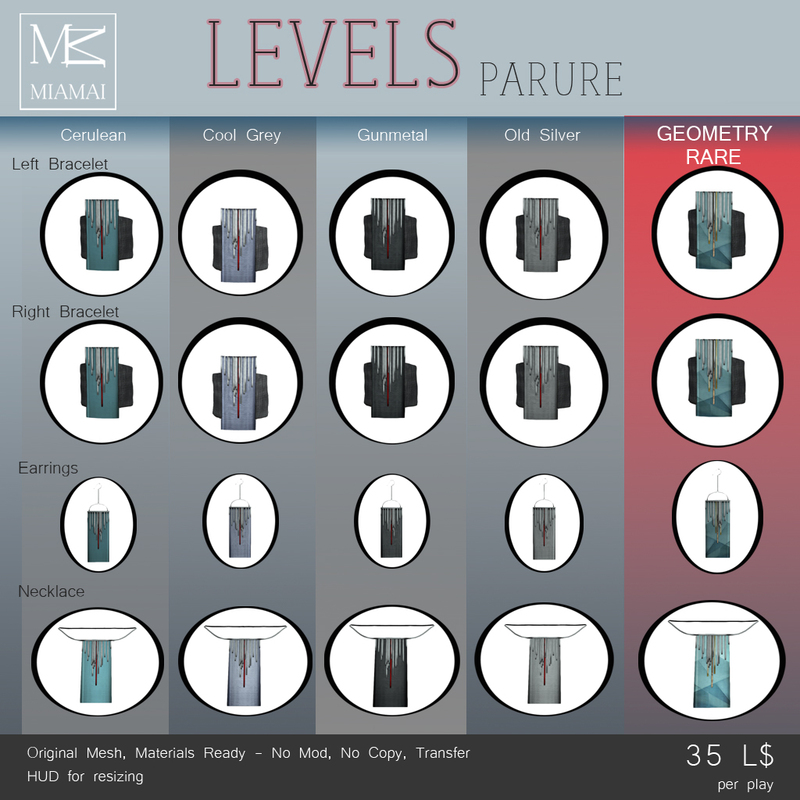 Levels Parure are 100% original Miamai mesh, materials, no mod, no copy, yes transfer, and come with a HUD for resizing. Collect all 20 pieces of the Levels Parure now at Shiny Shabby. The Hour Glass Necklace reminds us that even though we have many ways to track time, it flows becoming nearly impossible to measure. Artistically crafted metal drapes around the neck to secure a crystal ball with an hour glass encased in it. The metal wraps around the crystal sphere holding it like our minds hold on to memories, delicately, unable to fully grasp, ever flowing and moving like time itself. Simple yet stunning this piece is a must have for your styling. The Hour Glass Necklaces is copy, no modify with a HUD for resizing, 100% original Miamai mesh, and only at Shiny Shabby. *Please note that the crystal ball in the Hour Glass Necklace is stationary and contains no script to make it move as you move, or move in any other fashion. The description used is poetic to describe the origin of necklace, an hour glass trapped in a crystal ball. The Edo Bell Necklace is made from upcycled, Edo Furin, a Japanese wind chime that has been beautifully adorning the houses and trees of Japan for centuries. When the wind plays these chimes, each note fulfills the resident’s wishes and ensures their luck. These clear noted bells have been secured to lovely thin metal necklaces to carry your wishes with you always. The Edo Bell Necklaces is copy, no modify with a HUD for resizing, 100% original Miamai mesh, and only at Shiny Shabby. Shiny Shabby is open for the August round and Miamai has a gorgeous new jewelry release there, The Flora Jewelry Set! A beautiful celebration of nature the Flora Jewelry Set has organic details, leather, metals, and hand twisted wire work as an accent. 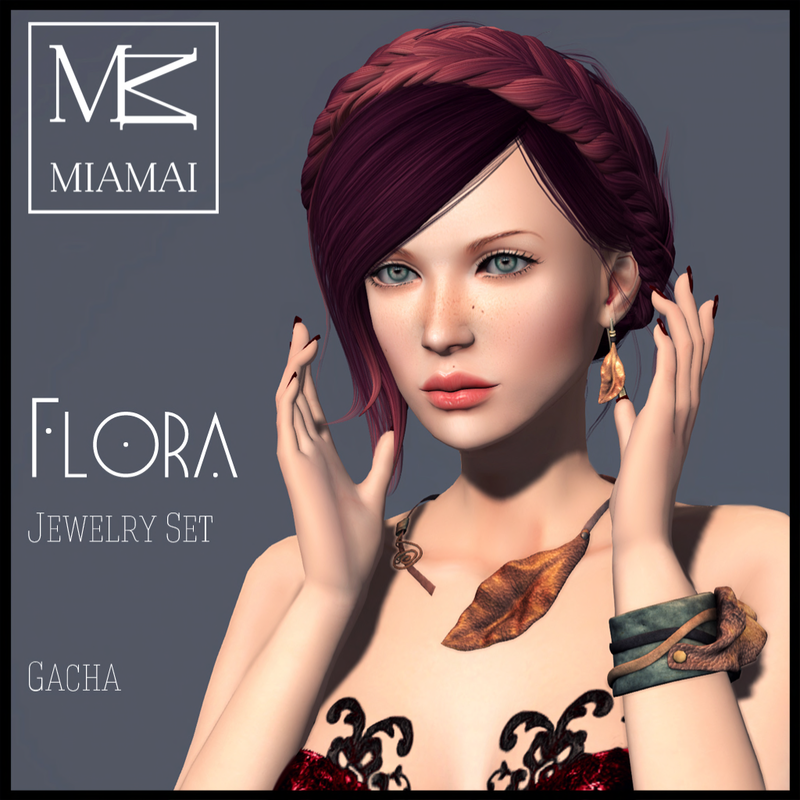 The Flora Jewelry Set gacha is 45L per play and has 5 cuffs, 5 necklaces, and 5 sets of earrings to try for with a rare version of each piece in black. 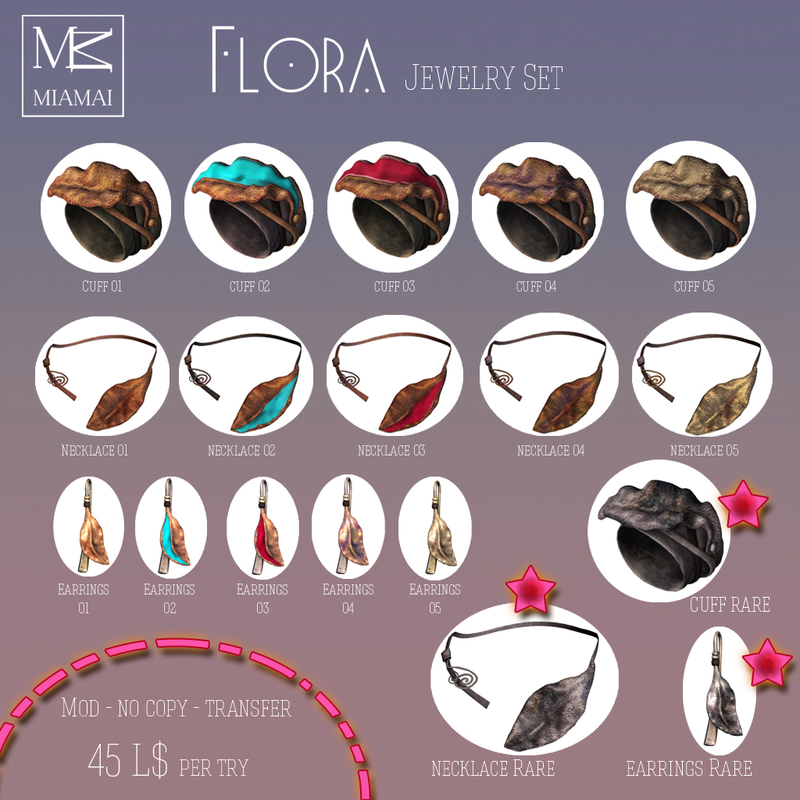 The Flora Jewelry Set is modify, transfer, and 100% original Miamai mesh only at Shiny Shabby.